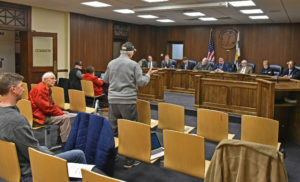 Cited as a “pro-commerce” move intended to keep new businesses and development projects coming to North Tonawanda, members of the common council said they will be moving forward with a traffic advisory board recommendation to make truck traffic more direct. That means instead of a circuitous route trucks currently follow through the city to avoid the residential streets Robinson and Wheatfield, these vehicles will be able to get to and from Niagara Falls Blvd. by using these streets as well as the commercial Erie Avenue or the residential East Robinson. Council President Eric Zadzilka said he expects the decision to be “unpopular” and a public hearing/information session will be scheduled within the next three weeks. The traffic advisory board unanimously approved the plan, Zadzilka said, adding that it was the River’s Edge project and the large amount of trucked-in soil that made it clear the city’s current route was untenable. The route was changed five years ago by Zadzilka and then-councilman Rich Andres when the city had less truck traffic, he said. 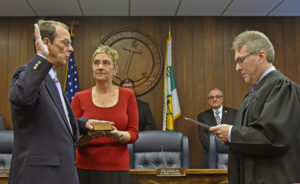 Alderman-At-Large Austin Tylec getting sworn in at North Tonawanda City Hall on Monday, January 1. 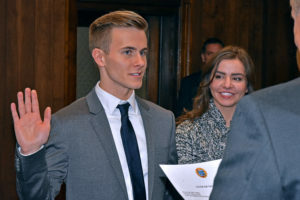 Meanwhile, the council welcomed new Alderman-At-Large Austin Tylec and expressed their willingness to work with the twentysomething architect from engineering firm Clark Patterson Lee. 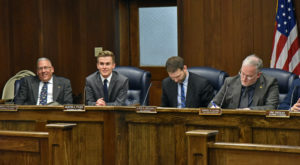 Looking to get involved with city committees, Tylec has expressed interest in serving on the city/school-district committee as well as the budget committee, which his bested opponent Jeffrey Glatz was a member of during its inaugural year. Re-elected councilwoman Donna Braun cited her work with Tylec and The Oliver Street Business Assoc., and re-elected Mayor Arthur Pappas also recounted his time serving with the then-NTHS freshman on the youth board. In other news, City Clerk Dan Quinn announced by Feb. 1st the city will begin recording city-council meetings and posting them online. Tylec, who along with others has publicly called for recorded meetings to be posted online, asked if they could also be streamed live and Quinn said he would look into it. Additionally, the organizers of a running race through Wurlitzer Park will be asked to attend an upcoming work session and detail how they’re going to inform residents of the event details. Residents had complained last summer they weren’t given sufficient notice about when the race would be occurring.